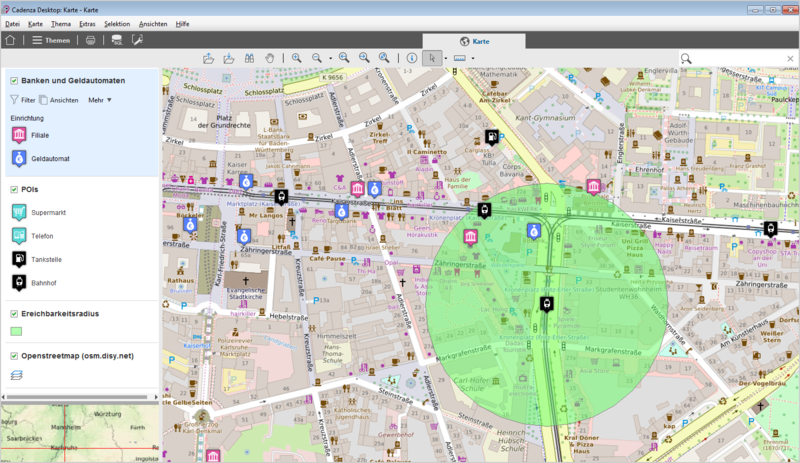 Cadenza uniquely unites data analytics, reporting and GIS in one product: All of your organization’s users can flexibly filter, analyse, visualise and prepare data and also send it to third parties – as table, chart, map or complete report. Cadenza provides a unified access point to all data of your organisation – from individual specialist databases and spatial databases right up to spatial data servers and organisation-wide data warehouses. As a software solution for your entire organisation, Cadenza offers different access points to your data: Cadenza Desktop for unrivalled flexibility in terms of analysis and design at every workstation, Cadenza Web for easy access to web-based analyses, maps and reports on the Intranet and Internet, and Cadenza Mobile for users on the go. With Cadenza’s desktop application, users run searches and create evaluations, maps and reports flexibly and easily, based on their spatial and attribute data. Cadenza Web is as easy to use as a browser. All content created by a data editor on Cadenza Desktop can be published immediately with Cadenza Web. Cadenza Mobile is the extended arm of your desktop GIS: Use spatial data and media attachments from your desktop GIS on your mobile device – even offline. Cadenza is not just a software product, but an entire software platform with modules attuned to one another. They establish organisation-wide reporting and evaluation systems with spatial reference and set-up spatial data infrastructures. No matter how many workstations you have or what kind of data and issues you have to deal with, the platform can be configured and optimised to meet the needs of your specific infrastructure. Cadenza is the only data analysis and reporting platform that offers an integrated fully-fledged geographic information system (GIS). As GIS platform it provides seamless access to all map data via different access points: As Desktop GIS for professionals, as a Web GIS for occasional users and as a GIS app for smartphones and tablets. This way you can also use and edit your spatial data on the go.